Custom Built Plastic Pallets reports that it recently developed an innovative material handling solution for VF Corp, an $11 billion apparel and footwear company. James Fischer, CEO of Jifram Extrusions, Inc, parent company of Custom Built Plastic Pallets, explains that his company offered a strategic material handling solution by building a plastic pallet specifically configured for the company’s order picking forklifts. The innovative hybrid pallet is constructed of plastic providing superior strength and durability. 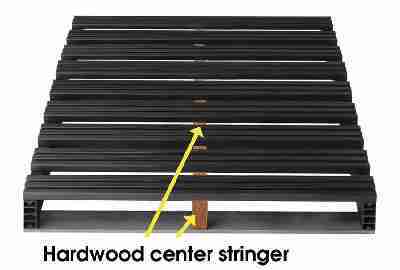 To further customize the pallet for VF Corp’s order picking operation, a hard wood 2×4 was swapped out for the center stringer. This hardwood stringer provides the perfect connection for the forklift’s clamp, providing a safe and secure platform for the operator working at various heights in the warehouse. Jifram Extrusions, Inc., parent company of Custom Built Plastic Pallets, is a plastic extrusions company that produces custom built pallets designed specifically for the needs of each customer that are made from recycled material. Size, number of stringers, number and thickness of deck boards, static weight capacities, use of casters and other accessories are all tailored to provide customized solutions, not a “one size fits all’ pallet.